They’ve made the headlines recently for all the wrong reasons. In December, just before Christmas, drones caused utter chaos at Gatwick Airport grounding planes and putting around 140,000 passengers’ best laid plans for traveling abroad to meet friends and family, or to just have a simple holiday, to an abrupt end. There’s no doubt that drones, in the wrong hands can pose a huge threat. But in the right hands they can save money and even lives. Instead of shunning them Ecclesiastical Insurance says that it’s currently trialing drone technology to enhance its risk management service for commercial customers. It said that using drones to provide aerial imagery of otherwise inaccessible parts of buildings will provide fresh risk insight and accurate data to support building valuations conducted by its surveyors. So far, the insurer has used the drones at three sites with a fourth site scheduled next year. It said that the drones have helped it to identify loose high-level slates, tiles and stonework and missing pointing. Amusingly, the drone also produced images of lost footballs, rugby balls and tennis balls sitting on the roof of one of the testing sites (a school), which were blocking the gutters. But it’s not only Ecclesiastical that has benefited from this technology. For St Hilda’s church in Halifax, the aerial images from a drone have been used to help support its request for a maintenance grant. It’s not the first time that drones have been used to inspect buildings. 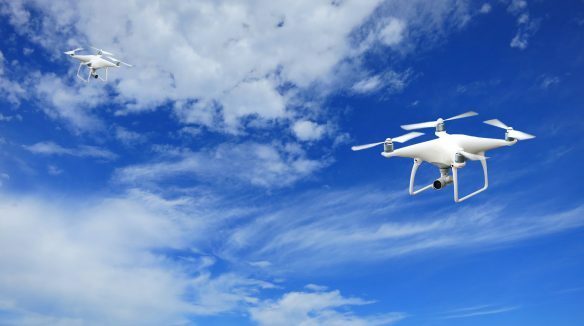 According to a blog by Accenture, Erie Insurance - an American insurer which provides auto, home, commercial and life insurance - was the first insurer to use drones to inspect roof damage back in 2015. Getting drones to do the hard and risky work when it comes to things like roof inspections can be quick and easy. Accenture highlighted that a 20-minute drone inspection can capture around 350 images of a property and provide data that can be used to identify things like moisture trapped in roofs, produce 3D models and elevation maps, calculate flood or wildlife risk and help to provide property measurements. There is a myriad of ways in which drones could help the insurance industry. Should disaster strike, they can be the ones to fly into non-secure areas way before they have been deemed safe for humans to access. And with additional specs such as thermal technology they can detect things like water damage, which is often not always seen with the naked human eye. Back in December, drones no doubt caused a lot of mayhem and chaos for travelers during the festive season. But, for the insurance industry, putting drones to work will not only benefit them but their customers too. Ultimately, their work can help in the reduction of claims and turn around work in minimal amount of time because they are able to help insurance firms conduct faster inspections. Drones have also been responsible for helping to reduce the number of fraudulent claims made too (particularly if they were used in creating images of scenes before disaster struck). Throughout the ages we’ve looked at technology with disdain and in some cases even fear, particularly when we’re concerned that it can take over our jobs (or potentially the world). But there has been no terminator-style attack on the Earth just yet. And with drones saving insurance companies money and reducing risks, it’s a given that they will be here to stay.